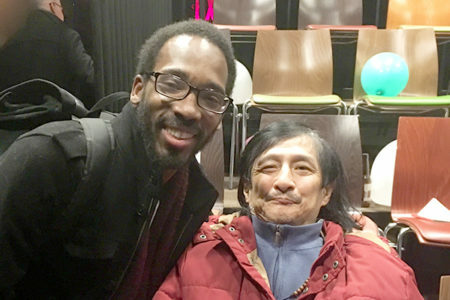 On Saturday, January 13th, ADAPT Community Network’s sign language specialist Yvette Churchill, brought some of our individuals to The Universal Drum, which is a special work by Willy Conley, a Deaf American playwright and theater professor from Gallaudet University. The show took place at the Dixon Place Theater in Manhattan. This show is designed for deaf individuals and others who use sign language to communicate. Our individuals were given the unique opportunity to be part of the interactive performance with deaf actors, which involves percussions, singing and acting in American Sign Language (ASL). At the completion of the production, each of our individuals were given a special gift and the unique opportunity to meet and take photos with Willy Conley. ADAPT provides special programs and services for the deaf community that support individuals who are hearing impaired. Our Communication Specialists provide a variety of opportunities for them to participate in community events and provide new ways to communicate with their peers and staff who may not be familiar with sign language. Communication Specialists also teach staff, program participants and community members ASL (American Sign Language) to promote a better understanding of sign language within the ADAPT community and beyond.